MSA's innovative new Full Body Harness is coated with a special urethane web coating to resist wear and tear in harsh working environments and extends the lifespan of the fall protection harness. The Safety Harness is also extremely easy to clean. 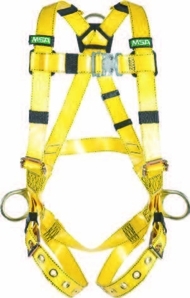 Harness Model 10155871 includes back D Ring and Tongue Buckle Leg Straps. The Vest Style harness is rated to 400 lbs (180 kg).